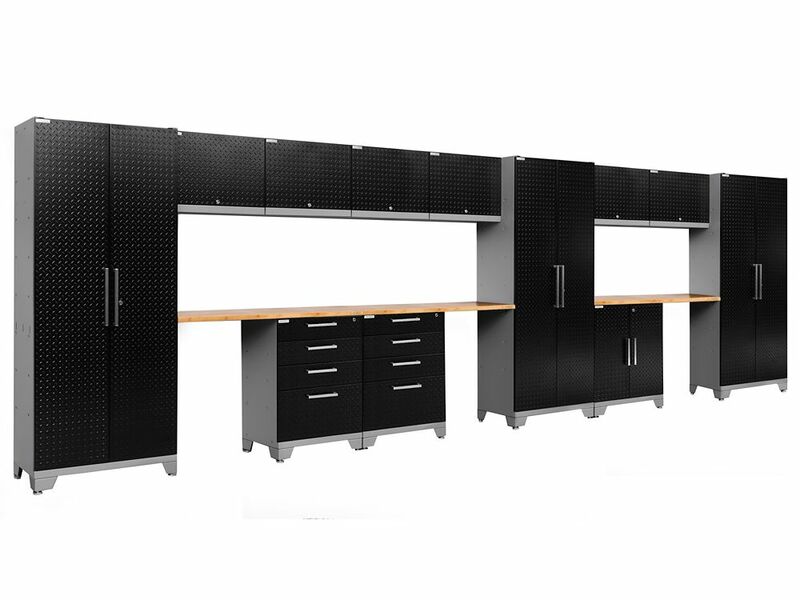 Performance Diamond Plate 2.0 Garage Cabinet Set in black (15-Piece) Get all those cables, decorations and gardening tools off your garage floor and into NewAge' newly redesigned, Performance 2.0 Series modular garage cabinetry. These cabinets are built to last with their fully welded, 24-Gauge steel frames and fully lockable, double walled doors. Our configured sets are shipped with adjustable steel shelving; easy-to-grab stainless steel handles and height adjustable leveling legs that accommodate uneven garage flooring. The manufacturer's limited lifetime warranty gives you the insurance that your cabinets will look great for years. Performance Diamond Plate 2.0 Garage Cabinet Set in black (15-Piece) is rated 3.5 out of 5 by 2. Rated 4 out of 5 by Henry from Satisfied with my purchase. These are so well packaged. A... Satisfied with my purchase. These are so well packaged. A base cabinet and two wall cabinets all stored inside the tall locker for shipping, stuffed with dense styrofoam. Only problem was the tabletop that comes separately, which gets dented and the home depot app ordered the wrong item.